I would have despaired unless I had believed that I would see the goodness of the LORD In the land of the living. 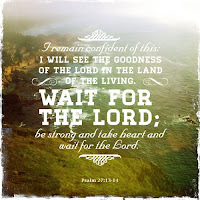 Wait for the Lord; be strong and take heart and wait for the Lord. Who knows that waiting is hard? 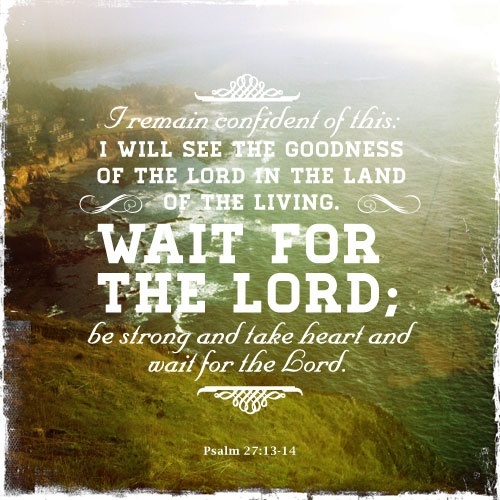 If you're like us, you are probably waiting on God for something? There's got to be one prayer you've prayed that hasn't been answered yet? How do you posture yourself when you're waiting? These are 7 ways we are waiting! 1. That the Lord has gone before us (as we have been praying) and prepared the hearts of ALL who will put their eyes on this proposal - that they will hear His voice and act on it. The Lord's will be done! 2. That God will move swiftly with a favorable response. 3. That God would give us increased wisdom, discernment and understanding to fulfill this call as it become reality. 4. That the property we are looking at (we believe is God's choice) will remain available and will be the perfect and ultimate place for this vision. And without any hinderances or issues. 5. That the Lord will bring around us (as He is always faithful to do) those who He wants to come alongside and be part of this in some form or another. 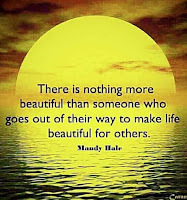 There is much that will need to be done above and beyond our experience and knowledge! 6. That not only would the provision for the vision be fulfilled, but ongoing consistent financial supporters. This endeavor is going to require a sizable monthly outlay for operating expenses. Our model is an upside down model - one that will be completely dependent on God and those God prompts to support us. 7. That God would continue to raise up intercessors for us and this vision. Opposition is a natural response and at full throttle when you're about to crossover! We need all the prayer we can get to undergird us and strengthen us for what is now and what lies ahead. 8. Most importantly - that when we step into this destiny God has so graciously created us to do, we would impact and influence ALL God brings our way! Our hearts are filled with anticipation and excitement - because we are ready to go to the next level God has for us. We want to serve, love on and bless as many as God so allows!! 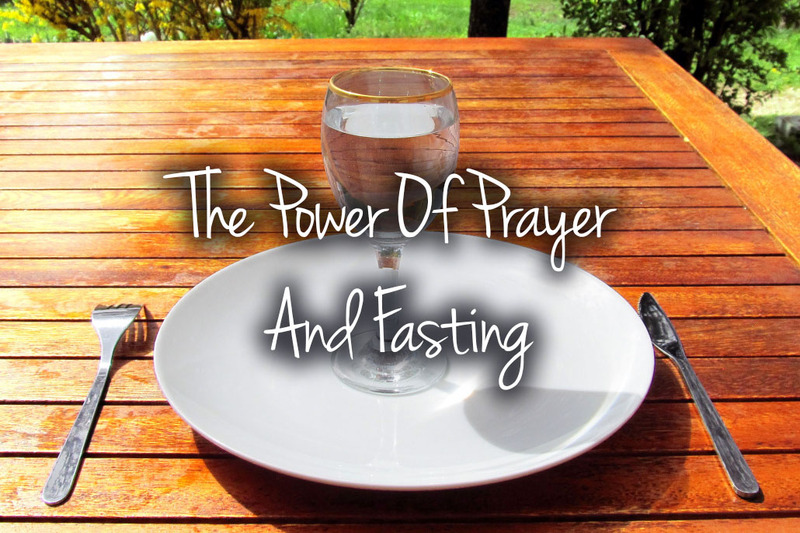 There is power in prayer and fasting! It breaks through the toughest barriers and brings the breakthrough. WE are so thankful for YOU! 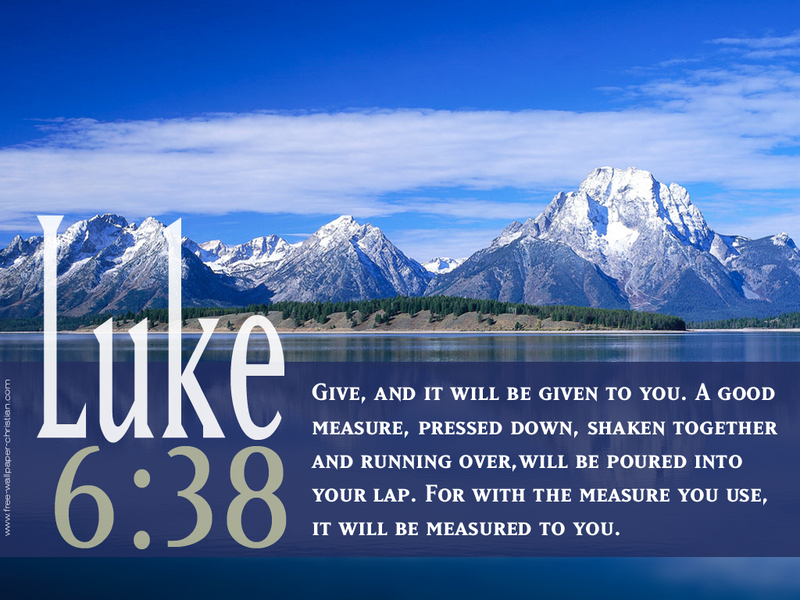 shaken together, running over, will be poured into your lap. Oh Wow!!!!! Last week's blog post, we asked if you would fast and pray for us, specifically on Thursday, June 14th. We were overwhelmed, blessed and encouraged by the response. Thank YOU ALL soooooooooo very much!! What an amazing gift Jesus gave us when we are called into His family. We have more brothers and sisters than we can count to stand with us! YOU are a GIFT to us!! We sent the blog on Monday asking for prayer on June 14th as we felt God prompted. Yes, there was a significant reason, though we did not know at that time. On Tuesday, a strategic and potentially vital call was scheduled for Thursday afternoon. God is so good!! Recently, we were asked if we had contacted a certain family about funding our vision. That statement provoked a series of thoughts and hope. 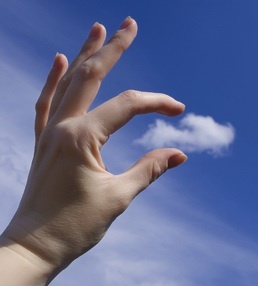 The Lord reminded me of Elijah in 1 King 18:41-45 that he mixed his faith with a small cloud and the Lord provided! The last week has been a whirlwind of activity, drafting, editing, seeking counsel and did I say editing to the millionth degree? So thankful for those God put before us to help us create this proposal This proposal was put together for a potential benefactor who could fund our vision!!!!!! Today, we submitted that proposal for their review and decision. We are ASKING again, if you would, please PRAY and FAST any day(s) you can in the next few weeks. Your prayers and fasting last week made a huge impact in bringing forth an open door. Actually, several open doors that were not expected. 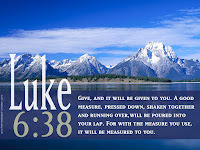 God gave us favor and He moved swiftly. Your prayers AGAIN will make a HUGE impact!!!! 2. That God will move in them swiftly to respond expediently with a favorable response. 5. That the Lord will bring around us (as He is always faithful to do) those who He wants to come alongside and be part of this in some form or another. 6. That not only would the provision for the vision be fulfilled, but ongoing consistent financial supporters. This endeavor is going to require a sizable monthly outlay for operating expenses. 7. That God would continue to raise up intercessors for us and this vision. There is and probably will be much warfare and opposition. That God would hedge us in, safely in His arms and care. 8. Most importantly - that when we step into this destiny God has so graciously created us to do, we would impact and influence ALL God brings our way! This has been and will continue to be an amazing journey God has us on. One filled with risk, faith, trust, tears, dependence on Him, joy and overwhelming gratitude for God's goodness shown through YOU! Without all of you God has placed in our lives, we wouldn't be where we are today. 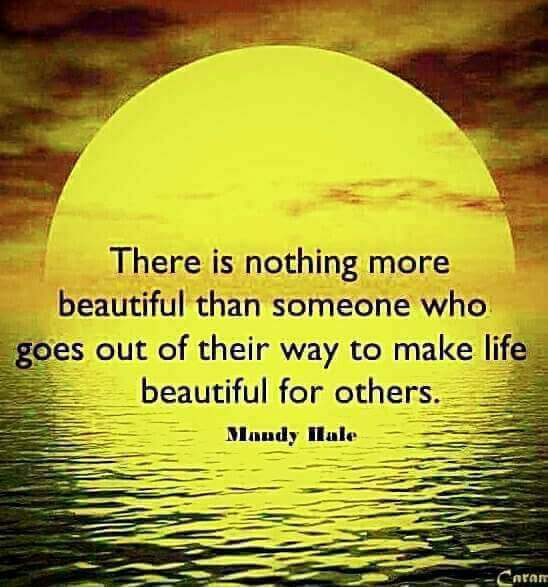 Each one of you has deposited such a beautiful part to our walk with the Lord. For that we are eternally grateful!!! !